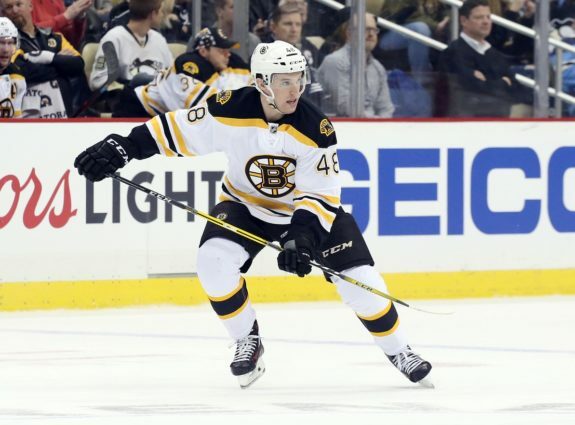 Earlier this week, I highlighted three Providence Bruins forwards who have the best shot at cracking the Bruins’ NHL roster directly out of training camp this fall. Today, I’m taking a look at which P-Bruins defensemen could do the same. As of now, it’s tough to tell exactly how much space the Bruins will have on their blue line next season. Many people believe that one of their defensemen will be taken in this summer’s expansion draft. It’s pretty safe to assume that Zdeno Chara, Charlie McAvoy, and Torey Krug are safe. Behind them, Adam McQuaid, Colin Miller, and Kevan Miller are all at risk of being taken by Las Vegas. Regardless of what happens, there will be at least one spot up for grabs this preseason, and the B’s will have a number of players from Providence fighting for that position. Matt Grzelcyk will be one of the front-runners to make Boston’s roster out of training camp next season. After four seasons at Boston University, Grzelcyk headed to Providence for his rookie season, where he was one of the Baby Bruins’ best defensemen. In 70 games with Providence this season, the 23-year-old notched 32 points — a very solid total for a defenseman. Of his 32 points, 26 were assists. That should be no surprise for those who have seen Grzelcyk play — his playmaking abilities are one of his best assets, and will be the key to success for him in the NHL in the coming years. Unfortunately for Providence, Grzelcyk struggled a bit in the playoffs, tallying just three assists in 17 postseason games. He also appeared in two games with Boston this season and showed off his puck-moving skills in the limited ice time he had. At just 5 feet 9 inches, Grzelcyk is small for an NHL defenseman. Like Torey Krug, however, who is the same height, Grzelcyk can make up for his size with his puck skills. If the former Terrier can prove that his talent can outweigh his size, then he’ll have a solid shot at starting the season with Boston in the fall. Former Yale standout Rob O’Gara is another Providence defenseman who will contend for a spot on the roster next season. O’Gara began his professional career with Providence last season when Yale’s season was ended. He only managed to appear in five games that season but scored his first professional goal during the stint. This season, O’Gara appeared in 59 games with Providence, earning 13 points and a plus-11 rating. He also played three games with Boston and boasted a plus-1 rating. A 2011 draft pick by the Bruins, O’Gara will turn 24 years old before the start of next season. At 6 foot 4 inches, O’Gara has the size to bully forwards in the defensive zone, and while he won’t wow you with his point totals, he will serve as an effective two-way defenseman. 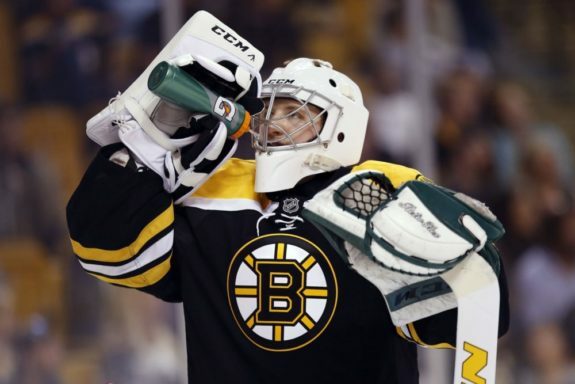 Of the many questions the Bruins have to answer this offseason, the backup goaltender position will be one of the most important. The B’s have several options to fill the crease behind Tuukka Rask next season, and Providence Bruins goaltender Zane McIntyre is an intriguing option. McIntyre was unbelievable with Providence this season, posting a league-leading .930 save percentage, accompanied by a 2.03 goals-against average in 31 AHL games. He struggled a bit in the eight NHL appearances he made this season, posting a pedestrian .858 save percentage and a 3.96 goals-against average. But, for a 24-year-old goaltender who was getting his first taste of NHL hockey, those numbers aren’t outrageously bad. McIntyre has demonstrated a very strong ability to improve his game – his .930 save percentage was .032 higher than his save percentage from last season. If McIntyre can bump his numbers up next preseason, then he’ll certainly be a contender for the backup role next season.